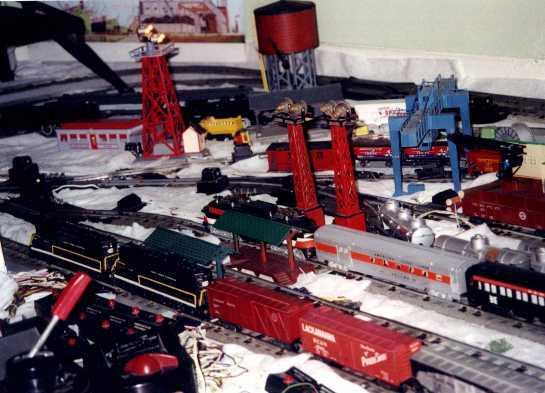 Welcome to the American Flyer layout that was on my living room floor last winter (99/00). The BIG CITY. Located in the Northeast, served by the New Haven and New York Central Railroads. 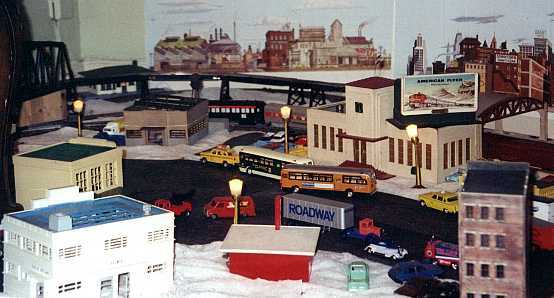 The busy downtown features a large passenger station. A freight cutoff line and an elevated line snake around the back, behind the furniture. The North Coast Limited arriving on its annual holiday promotional trip for rail tourist travel in the Northwest. The Limited has cleared the terminal throat and a New York Central freight behind two GP-7s pulls through the center track of the terminal. A New Haven passenger train barrels down the wall, staying ahead of the fast freight in the last photo. 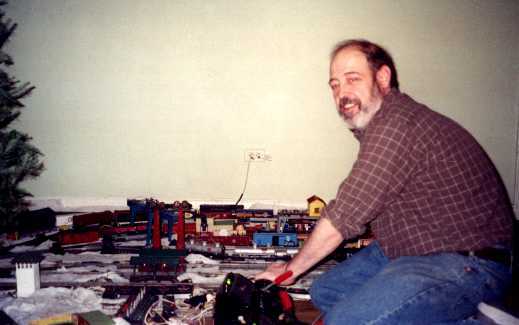 A NYG Baldwin switcher is working the busy yard. The middle passenger car is made from ii silver bullet coach bodies spliced together. The NYC freight is next. Its GP-7 diesels are connected with three tiny m.u. cords so they operate off one reverse unit. The other reverse unit is locked in neutral. They can be prepared for independent operation in seconds. 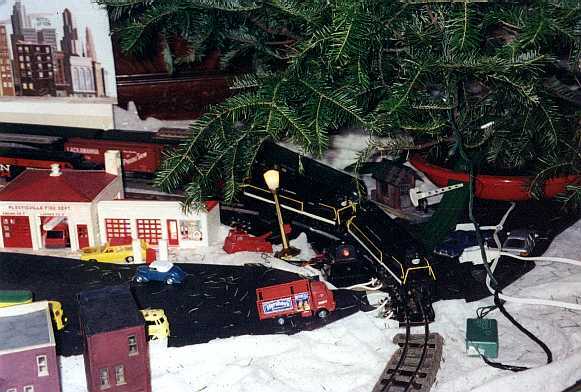 The passenger train has ducked into the station at the end of its run as the freight clatters past. 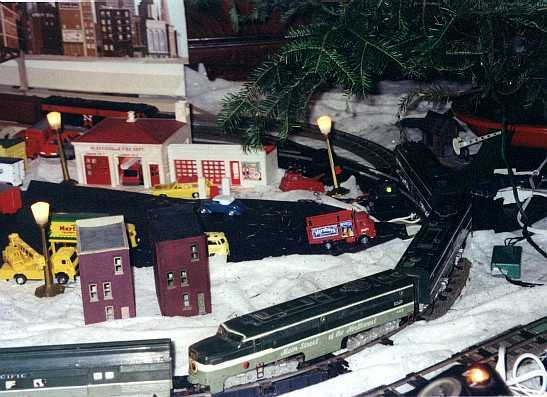 This layout was set up on the floor of my living room, it was a loop to loop track system with reverse loops automated by track trips at each end. In between the loops was a folded over figure 8 created with trestles. It took a train over a minute and a half to go around once. All track power was controlled by the turnouts. A system of track trips, semaphores, and switches permitted automatic route selection through the figure S if desired and protected against derailments at some turnouts. The room was used normally for entertaining, watching TV, etc., while the railroad was up. I'm here to tell ya running em on the floor is fun! Note the glee in the operator's eye as the GP-7's, which just left their train in the yard, are now heading to the engine terminal.